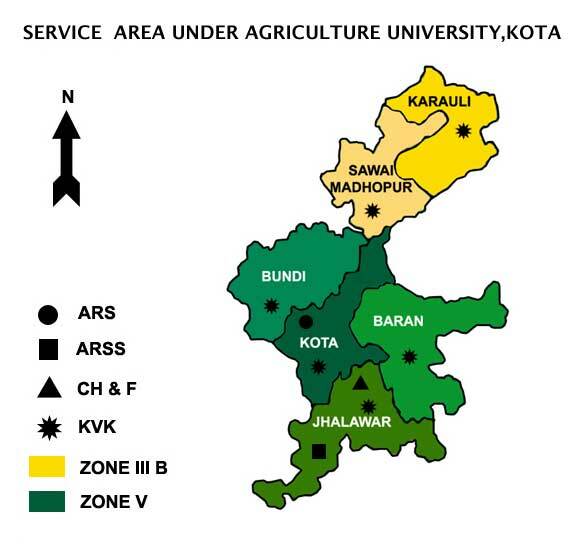 The Agriculture University, Kota (AUK) was established on 14th September, 2013 after bifurcation of the Maharana Pratap University of Agriculture & Technology (MPUAT), Udaipur and Swami Keshwanand Rajasthan Agricultural University (SKRAU), Bikaner through promulgation of Act No. 22 of 2013. The University has been created for the agricultural development in South-East and Eastern Rajasthan which is having diversified agriculture situations from rainfed to canal irrigated agriculture. The Agriculture University has its Headquarter at Borkhera Farm, Kota & is located on Kota-Baran National highway-76. Kota district is situated in the South-Eastern part of Rajasthan and comes under Humid South-Eastern Plain Zone (agro climatic zone V). It lies between 23045’ and 26038’ North latitude and 75037’ and 77026’ East longitude. The jurisdiction of AUK is spread over in 6 districts namely Kota, Baran, Bundi, Jhalawar, Karauli and Sawai Madhopur. It accounts for 9.98 % geographical area, 12.67 % total human population, 9.4 % live stock population, 31.59 % forest area and 20.6 % net sown area of the state. Development and education of modern practices in the field of Agriculture, Horticulture & Forestry for sustainable livelihood of the rural masses is the main thrust of the service area of AUK. The following units of teaching, research, extension and seed production are in operation under the jurisdiction of Agriculture University, Kota.